Tension-free hernia repair with reinforcement by synthetic, nonresorbable mesh has led to a drastic reduction in the rate of hernia recurrence. However, these permanent foreign materials have been implicated in post-operative complications and shunned from the use in contaminated operative fields. Acellular biological mesh was developed as an alternative, and popularized for the use in contaminated fields. Yet, these biological meshes were extremely expensive to develop and produce, thus burdening the health care system with an elevated cost. It has also been found that with time, biological meshes are associated with higher rates of hernia recurrence. Thus, various synthetic bioabsorbable meshes have now been developed that provide the strength of synthetic mesh along with the low infection rates associated with the use of biologic mesh. These meshes are extremely durable and have been developed at a reduced cost. It also appears that they can be used in contaminated surgical fields with outcomes similar to those of biological mesh. It is of note that the majority of current studies in regard to synthetic bioabsorbable mesh have been performed in either animal models or small human case series, and we are just now starting to analyze the data on larger human population studies. Currently these meshes include Ethicon Vicryl Mesh (Ethicon Inc., Somerville, NJ), Phasix Mesh (C. R. Bard, Inc./Davol Inc., Warwick, RI), Tigr Matrix (Novus Scientific, Uppsala, Sweden), and Gore Bio-A (W.L. Gore and Associates, Inc., Flagstaff, AZ). The specifics of these meshes will be addressed within the chapter. We will also review which synthetic bioabsorbable mesh is best to use in a contaminated field and if there is any merit to impregnating mesh with antibiotics. 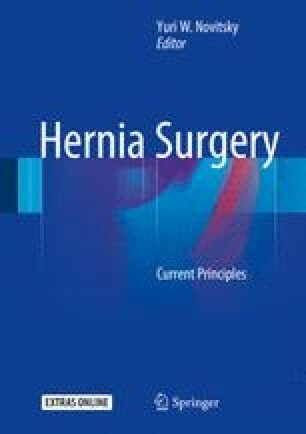 A synopsis of our algorithm for which type of mesh to use, when to use it, and what type of hernia repair we prefer, is also included in this chapter.